Middle Kids encompasses 2nd and 3rd grades. During the middle kid years, students become responsible, independent citizens. They continue to develop a deeper sense of self, form their own opinions and beliefs and discover their autonomy. Our curriculum is designed to foster this growth. We always aim to teach the whole child, focusing on academics, the students’ interpersonal skills, conflict resolution, self-responsibility, initiative and independence. Middle Kids at Rivendell participate in a variety of math activities weekly. The curriculum is individualized to meet each student’s needs. Therefore, during a math work session, while some children may be working on beginning place value, others might be delving into decimals or even beginning algebra. Progress through our math curriculum is based on mastery learning. Concepts are introduced concretely with manipulatives one-on-one or in small groups. Each student works in several math books suited to his/her abilities. Mastery of concepts is assessed through daily observations and interactions with the teacher, as well as tests upon completion of each math book. Our math specialist visits each classroom twice a week to introduce and strengthen math skills through activities and games to further enhance a love of math. Middle Kids practice memorizing math facts through an individualized online program called Reflex Math. Reading in Middle Kids is strengthened through a workshop model which we call Reading Workshop. Children choose books, fiction and nonfiction, which interest them. They are taught how to choose the “just right book” based on their individual reading levels. At this age students continue to work on phonics and decoding skills, while also learning how to think about what they are reading. Comprehension strategies of prediction, making connections, wondering and questioning, inference, visualization, and summarization are taught so that children are more engaged with their reading. Decoding skills, such as identifying consonant clusters, consonant digraphs, vowel blends, and silent e are practiced and reinforced. Different literary genres are introduced. Students enjoy reading their choice of book. 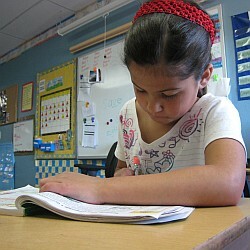 In Middle Kids we focus on a wide variety of writing styles. Students reinforce their writing skills through regular impromptu writing warm-ups, creative narratives, expository and persuasive paragraphs. Creative writing is taught in a writers’ workshop format moving through the steps of brainstorming, drafting, editing, revising and publishing. Expectations and goals are unique to each student’s level of ability and assessed regularly through student-teacher conferences. Students learn correct grammar and punctuation through authentic writing and weekly grammar lessons. Students learn how to write a proper paragraph with a topic sentence, supporting details and conclusion. Upon completion of a new story, each student is given the opportunity to share his or her masterpiece in the Author’s Chair. Bi-weekly recitations and related write-up as part of homework. Social Studies and Science are taught in school-wide topic units. Students explore the topic in a variety of ways, including writings, stories, art projects, math, and hands-on experiences. Students attend science classes weekly where they learn the scientific process, perform experiments and record their results. Topic units are integrated into all specials classes wherever possible. In Middle Kids, students participate in our annual Science Fair. Annual field trips enhance topic unit studies.